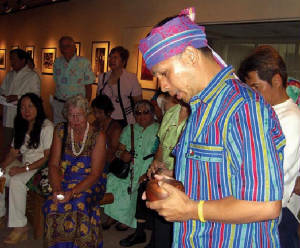 Art Tibaldo doing a courtship dance at the opening rites of EWC-Gallery. The gangsas echoed with a familiar sound and I just can't resist the temptation to dance. Aayyyeeeh! 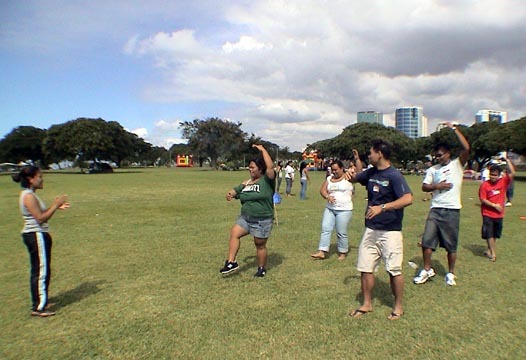 A group of young Filipinos called "Timpuyog" converge regularly at the Ala Moana Park to socialize and practice cultural dances reflective of their culture. 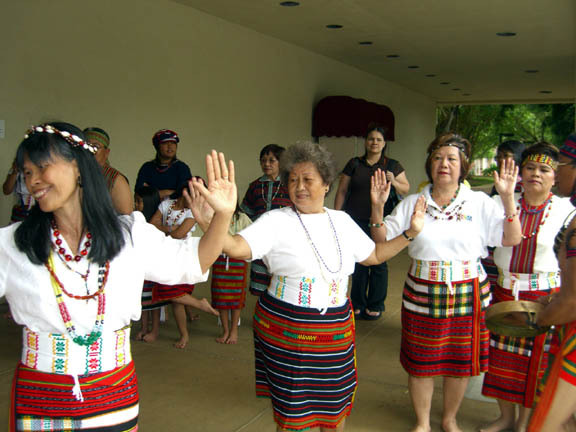 The Timpuyog members are generally composed of young locals of Ilocano parentage. Upon my return to the Philippines, I went to see Ramon Obusan in his residence-studio in Pasay City. Ramon Obusan`s Ballet Folklorico de Filipinas is a resident folk dance company of the Cultural Center of the Philippines in Manila. They run their own theater, give many performances throughout the year, and travel all over the world for every official purpose. 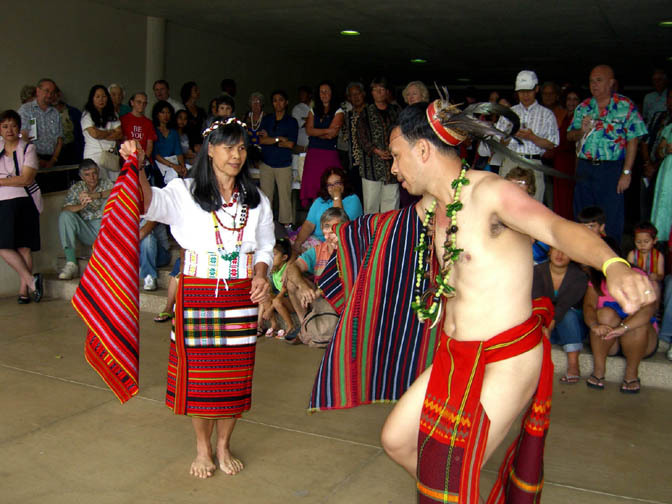 In Hawai'i, they will offer insights of the various ethnographic aspects of their homeland, from the ritual dances of the mountain dwellers of Luzon to the folk dances of Mindanao to forming a marriage of Spanish-Mexican dances and ancient tribal customs. The company will feature 20 dancers & musicians performing with primitive gongs, moving to kulintang music or the rhythms of Spanish guitars. The year 2006 is truly a special year for thousands of Filipinos now living in Hawai’i and my short stay in the island state is as memorable as the locals especially when I became part of their celebrations. 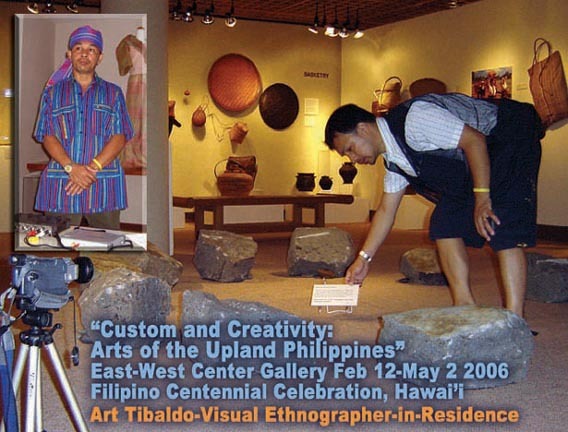 It never came to me that I will be involved in the Filipino Centennial Celebrations until William Feltz, the Arts Coordinator of the East-West Center sent an e-mail inviting me to present the upland culture of northern Philippines as a Visual Ethnographer. 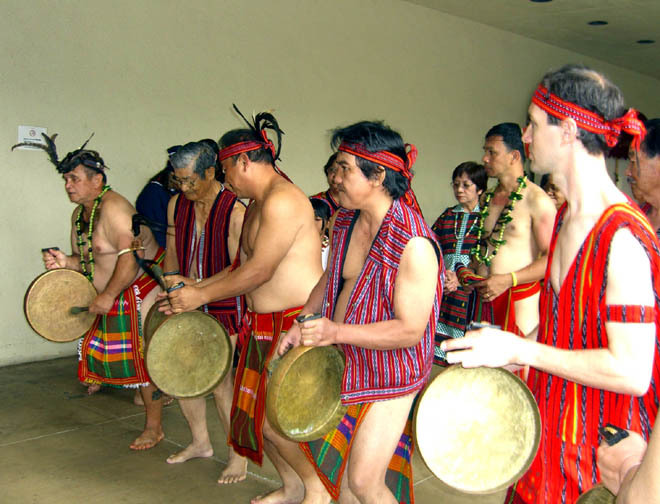 After having documented numerous rituals and customary practices of the various tribes in the Cordillera for years, I can say now that it pays to treasure our tribal heritage. 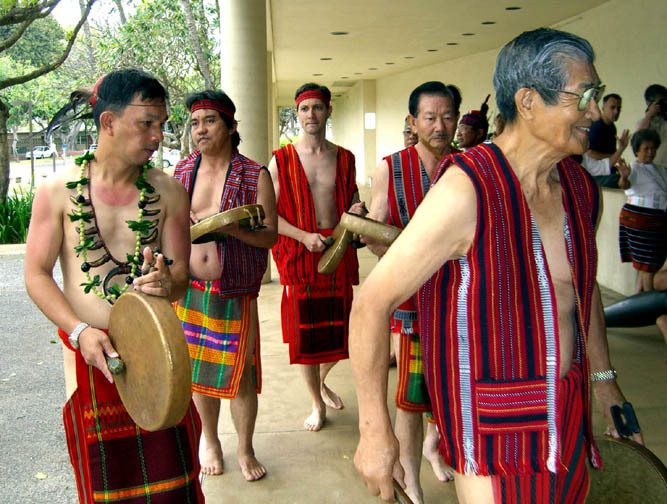 I have met Bill about twelve years ago and we have exchanged emails and videotapes about the peculiar customary traditions of Hawai’i and Cordillera. Last year, the East-West Center Art Gallery Curator, Dr. Michael Schuster came to Baguio for what seems to me an arts and carfts expedition. I gave him the necessary contacts and references and he later proceeded to Sagada and Banaue to collect exhibit materials. Michael also met with the Tamawan artists and Tommy Hafalla who contributed to the ongoing exhibit at the EW Gallery. I also took Michael to my office at DTI and his attention was caught by some contemporary products displayed in our One-Town-One-Product corner. Together with native baskets that he got from Banaue that included a walking cane, the items are now on exhibit at the said gallery. After recieving my approved visa and official leave from my work, I enplaned to Honolulu on the 7th of February and arrived on the same day despite the almost ten hours of flight. Juny La Putt, a retired Philippine Army Colonel and a Civil Engineer who just retired from Honolulu Engineering Department met me at the airport and drove me to the University of Hawaii where EWC is located. More popularly known as the Hawaiian Webmaster, Juny became my tour master for several days taking numerous digital shots of me including our tour in Waikiki beach and the opening program at the EWC Gallery on February 12. Juny started building websites as early as 1994 and he has helped promote the Philippine Military Academy and Baguio City in the world-wide-web among others. With Juny’s long experience with HTML and internet publishing, I consider him as a website guru. In fact, he is in the process of publishing his latest book on Web Page Development. Five of his earlier books on Surveying published by National Bookstore are still widely used by Engineering students. During my stint as filmmaker-in-residence at the East-West Center, I was lodged at the Lincoln Hall where I stayed for twelve days in a hotel like accommodation complete with TV, telephone and fridge. As a Visual Ethnographer, (a title used during my tour) I showed clips and segments of my video documentaries on customary practices in the Cordillera and had dialogues with students and exhibit goers. A 15 minute video on DVD was also played non-stop in a 21 inch flat screen throughout the duration of exhibit period. I was invited to speak at the Kapi’olani Community Colleges where I had a good number of students taking up Anthropology. Raymund Liongson, a commissioner of the Philippine Centennial Commission and a professor at the Leeward Community College also invited me to speak before his 11-12AM and 1-2PM classes. 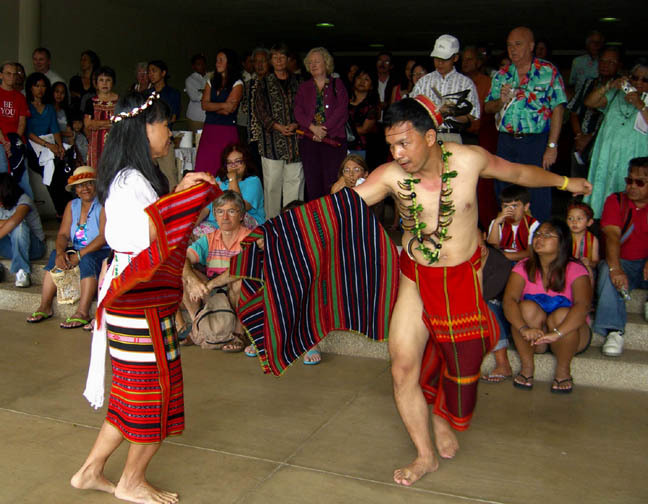 My coming to Hawaii was very timely as the school's curriculum had a Philippine Studies Colloquium Series that discussed indigenous people’s culture. At the offices of Bill and Michael, a calendar was posted just for my schedules and it was heavily dotted with appointments. Angel Galas is just too happy to meet a "Kailian" and at the same time proud to sport his stars and stripes.